Home > Personal Finance > Retirees: Do You Have the Right Bank? Retirees: Do You Have the Right Bank? Are Fees, Fraud Eating Away at Your Social Security? If you are over 50, retired, or hoping to retire soon, now is a good time to make sure you’ve chosen the right bank. And your decision isn’t just about the financial products and services you need now, but the ones you may need in the future. Nancy Butler (not her real name) learned this the hard way. The 56-year-old Tampa resident had banked with the local branch of a major national bank for 15 years. She had maxed out her credit cards during a prolonged period of unemployment, but with a new job and restored income, she approached her bank for a loan, intending to consolidate her credit card debt and slash her 15% interest rate. Yet even with a healthy 401K, $600,000 in home equity and a stellar credit score, her request was declined. Why? It turns out that the staff of her branch had no local lending authority, and her banker made a poor case for her loan to the regional loan officer, who decided Nancy was a bad risk because she’s self-employed. Her story isn’t unique. Banks may have gotten better at some of the impersonal kinds of service — P2P payments (electronic payments you make by email from your account to someone else’s), mobile banking apps and ATM locations. They’re not necessarily good at the services that are rooted in a personal relationship, where a bank manager knows you, your financial situation and your creditworthiness, and who can go to bat for you when you need help. Convenience, both in terms of physical location and online offerings. ATMs in your neighborhood or around the world, wherever you will be traveling or relocating. The security of knowing that the staff in a bricks-and-mortar location knows who you are in case you have a problem or need advice. The ability to make automatic deposits, transfers and withdrawals. A checking or savings account and an investment account used for your retirement funding. Home maintenance, repair and improvement. Think about that $15K replacement roof, a garage conversion for your widowed mother-in-law, updating the kitchen and bathrooms to prepare your house for sale, or the replacement of big-ticket items (appliances, windows, HVAC system). Travel or other discretionary expenses (such a wedding, down payment assistance for an adult child’s house purchase, a grandchild’s college tuition) that you are committed to even if you have to borrow to do it. Non-discretionary expenses you must make to keep your life flowing normally, such as a new car. Small-business loans, in case you want to fund a new business toward the end of your career. Then find out what lending authority your banker has, presuming your bank offers personal loans for these kinds of things. Research your lending officer’s requirements — most likely your credit score, income, assets, and in the case of a startup, a business plan — before you sit down for a meeting. What constitutes great service is a personal matter. Do you want to be greeted by name by tellers? Are you irked when you have to fill out a form before a simple question can be answered by a banker? Or do you just want a great customer service agent on the phone if you want to make a transaction, ask a question or solve a problem? If the answer is the latter, you may be satisfied with online banks (like Ally), online mortgage lenders (like Lending Tree) and an independent financial adviser rather than a traditional bricks-and-mortar bank that can handle all of these functions. 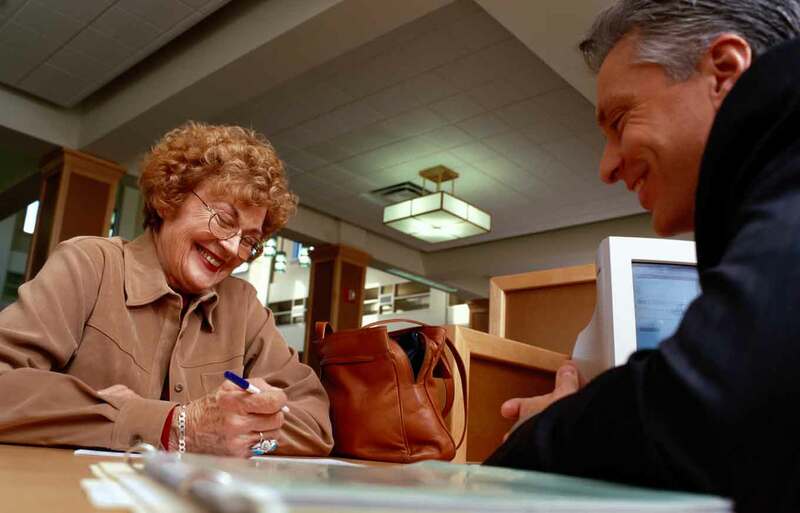 If you want a single institution to handle your financial services, including checking, savings, credit cards, insurance, retirement and investment accounts, loans and online banking, you may find what you need — plus highly personal service — from a credit union or regional bank, both of which may offer the personal attention that global banks may not be able to match. Whatever financial institution you choose, always make sure it is FDIC-insured. There’s another good reason to build a relationship with a banker, and it has nothing to do with money. It’s about connections. Bankers are a trove of information on people and local businesses, as well as news that may have some bearing on the decisions you’re about to make. These personal networks are particularly valuable if you’ve just moved somewhere new and need recommendations for real estate agents, medical professionals, mechanics and contractors, or if you simply have a question about neighborhoods, churches and great restaurants. George’s Amazon 5-star rated book, "After 50 It’s Up to Us: Developing the Skills and Agility We’ll Need", has rave reviews from Richard Bolles, author of "What Color is Your Parachute".